The West Linn football team wanted to prove that it was the best all year. 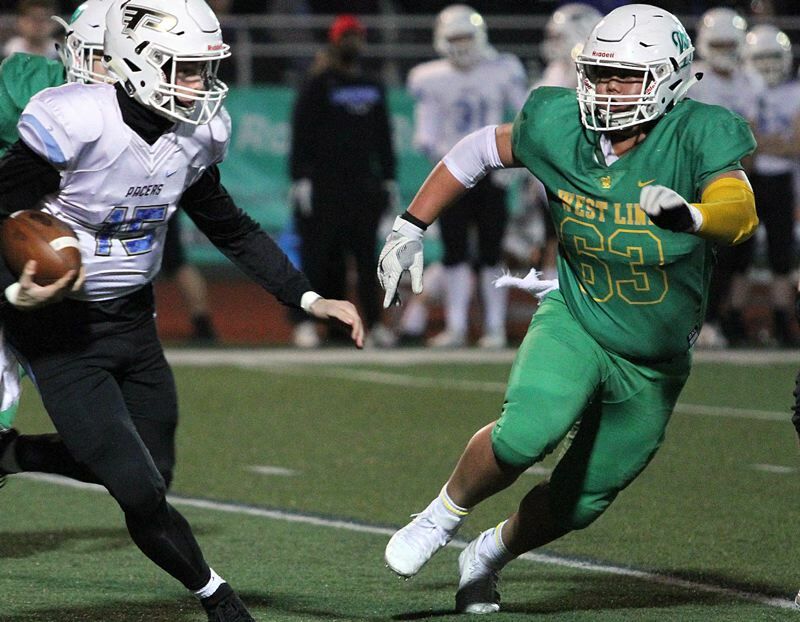 The Lions battled the state's best, the Three Rivers League's best and the playoffs' best before finally falling to Sheldon in the Class 6A state quarterfinals. Thanks to their efforts, the Lions saw players amass nine berths on the 2018 all-Three Rivers League first team, their efforts highlighted by the selection of junior lineman Ryan Seth as a two-way first-teamer and the TRL's co-Offensive Lineman of the Year. Joining Seth on the all-TRL first team for offense were senior wide receiver Cade Knutson, junior wide receiver Casey Tawa and senior running back Dawson Jolley. Knutson led his team with 62 catches for 1,043 yards and 10 touchdowns, while Tawa came through with 63 catches for 904 yards and eight scores. Jolley, meanwhile, piled up 1,572 yards and 22 TDs on just 182 carries — good for 8.7 yards per carry and 143.2 yards per game. "Dawson Jolley is simply one of the top three or four running backs in the state," Miller said. "(He) combined for over 1,000 yards in just the last four games. An extremely dynamic explosive player." On the defensive side of the ball, Lions' first-teamers included Seth, senior inside linebacker Brian MacClanathan, senior outside linebacker Elijah Ntsasa, Tawa — the team's other two-way first-team pick — at cornerback and senior Max Jacobs at safety. MacClanathan tied for the team lead in tackles with 115 (including 7.5 for loss with 2.5 sacks and one interception), Ntsasa had 90 tackles (3.5 for loss), Seth made 47 stops (12 for loss, including five sacks), Tawa made 41 tackles (one for loss with one interception) and Jacobs had 90 tackles (6 for loss and two interceptions).